Slender mens Rotary watch featuring a PVD gold-plated case, champagne-coloured dial with baton hour markers and date function, and a slim brown leather strap. Very pleased with the purchase, value for money and excellent service thank you. Can not better and cheaper with free delivery. The service was very good and the product was in nice condition and the product arrived on time. Absolutely thrilled with this watch exactly what Ive been looking for as a replacement for my husbands previous much loved one. 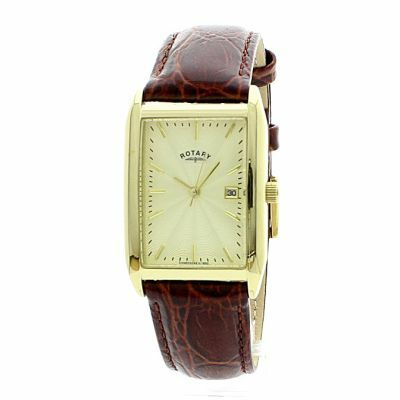 The perfectly shaped gold face and brown leather strap makes this a truly classic watch.Have been searching for some time and then found this one, my husband was delighted. Speed of delivery excellent. Was generally very pleased with the watch, however, the strap is much more red in colour than brown, as shown in the main photograph and as I had hoped it would be. I will be keeping it, as it is a gift and I dont have time to order another, but the colour description is a bit misleading. Otherwise, very happy. A lovely classy watch, beautifully made and not too expensive. The only negative I can think of is the date window could be a little larger. Other than that a really nice watch. Im very pleased. I am very pleased with the rotary watch received from your firm, the style is exactly as stated and the price was very fair. I have purchased about thirty rotary watches over the past ten years as presents and have never been let down by faults or service.